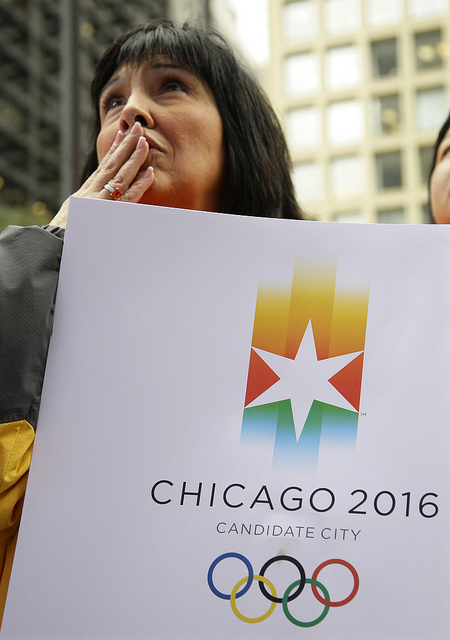 A Chicago 2016 supporter reacts during the announcement from the 121st International Olympic Committee on the host city for the 2016 Summer Olympic Games in 2009. There&apos;s been much worry in Chicago over the NATO summit&apos;s impending start next week, but comedian Katie Rich points out that the event bears a striking resemblance to another large-scale event the city was actually looking forward to: the Olympics. Read an excerpt below or listen above. You guys the Olympics are coming! We got &apos;em! What? Oh. Oh sorry. It&apos;s NATO. Okay. Sorry. NATO is coming to Chicago! OHMYGOD. And as we all know, NATO stands for Experimental Prototype Community of Tomorrow. The NATO summit is coming and please let us never stop calling it the NATO summit. Because that is so titillating to me. Because when I hear NATO summit I see the Justice League and I see mountains and then I see a blue whale just breaching over all of it. But what it really is, is like, dudes in a conference room in McCormick Place with like, pitchers of water that are sweating on wet table clothes. That&apos;s all it is. So does anyone know why NATO is coming? Exactly. Well I will give you the answer: because Rahm could get it.